Give voice to his daughter. Then, give more than voice to millions of disabled people. Just in Brazil, 15 million people can’t speak. They are people with Autism, Cerebral Palsy, Stroke Sequelae and many other diseases or disabilities. Our biggest challenge was to create something that really works in the hands of people with disabilities. Many people with disabilities can’t touch in the tablet like we do. So, we created an exclusive technology named “Intellitouch”. Livox calculates how many fingers are touching screen, if fingers are being dragged and many other factors to “fix” the touch of people with disabilities. It just works! Also, Livox design is extremely simple. Though someone can make more than just “speaking”, our design is always the same. For example: let’s say a disabled person wants to play a music. There’s no “play”, “stop” or “pause” button. You simple “touch”. If you want to stop the music, you touch again anywhere. If you want to start over, you just touch the button again. This is very important because we are dealing with people with severe cognitive and/or motor impairments. Our purpose is to empower disabled people to express themselves, have fun and interact. Livox creator’s daughter has cerebral palsy. Also, he manages a rehab clinic so he lives this situation 24/7. We had an amazing acceptance in Brazil. So we made a deep research with several disabled people. This research included speech therapists, occupational therapists, teachers, etc. We made this research with a wide range of disabled people. People with cognitive impairments, people with motor impairments, people with visual impairments. This enabled us to understand their needs and create something unique. Livox can be used even by totally blind people. Again, our design makes a huge difference. A disabled person just needs to touch anywhere in the tablet. He/she doesn’t need to touch in a specific button to make it work. It can be used (and it IS really being used) at home, in schools, hospitals, etc by people with Autism, Cerebral Palsy and many other disabilities. 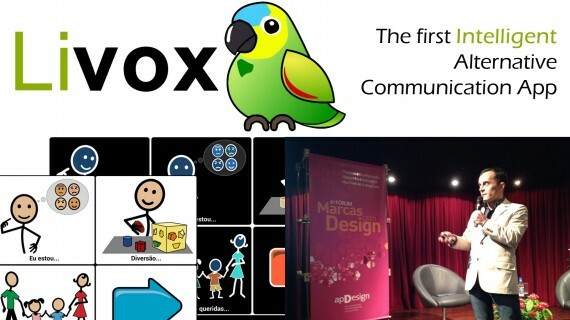 There are already thousands of brazilians using Livox. We have people with a wide range of disabilities using Livox. We are in all TV stations, magazines and brazilian newspapers. We have already travelled more than 80,000km just in Brazil taking Livox to many people, speaking in conferences and training disabled people and families and caregivers on how to use our app. We even spoke in a TEDx Event!!! We decided to create Livox for Android tablets and thousands of brazilians bought their first tablet just to get a Livox for their beloved ones. Several brazilian states and cities are buying Livox licences for schools, hospitals and rehab centers. Simplicity for disabled people and simplicity for caregivers. We decided to create an app for Android tablets since they are affordable and they had several sizes. In Livox you can create “sets” with the same meaning and these sets can be easily nested. So, someone can touch in “I want to…” and Livox will speak “I want to…” and you will see several new sets related to “I want to…”, like “eat”, “drink”, etc. If you want to create an sublevel all you have to do is click in a set in edit mode. Then you can create infinite sets with infinite levels. Each set or level can speak, play music, movies, do tests for school and many other things. IT’S LIKE A WINDOW FOR THE TABLET. 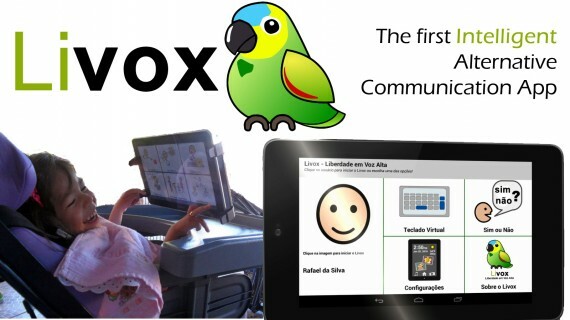 That is, Livox helps disabled people to do things in a tablet that they couldn’t before. All is done in the very same way, just by touching a set. It doesn’t matter if it will speak, play a music, a video, whatever… it will just work. Also, Livox has several parameters for cognitive, visual or motor impairments.